These single serving lemonade mix favors are personalized with your message and 1 of 20 adorable religious themed designs. 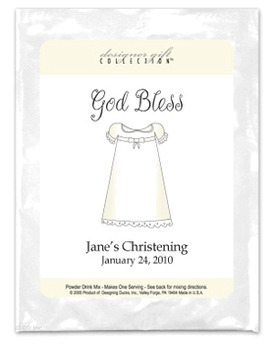 They're a wonderful accoutrement to give at your Christening, Baptism or any special religious event! Assembly: These will arrive with self sticking label sheets and easy for you to apply to each packet.